You probably know by now BTC works and how cryptocurrency has reshaped the world as we know it today. The number of people that are using cryptocurrency on a daily basis has multiplied to crazy numbers since it was first introduced in 2009! We can talk about how digital currency started and what it is now but that’s not what we’re talking about today. We will be talking about crypto signal services along with the websites that provide such services. But what are BTC/Crypto Signal Services? For starters, BTC signal services provide a trader arbitrage for different exchange websites that provide crypto services. If you are subscribed to any of the signal services, you will be able to get direct information from the service you signed up with and use that to your advantage. What’s great about having to work with this type of service is that you get a front-row seat on the prices across the board without having to focus on what website alone. In other words, you get to have an automated assistant telling you when to buy or sell a position. In addition, crypto signal services can help you see “pump and dump” situations in advance and profit from it. Without further delay, let’s talk about that! TurtleBC.com got its name from the famous “Turtle Trading” that was made famous years ago. 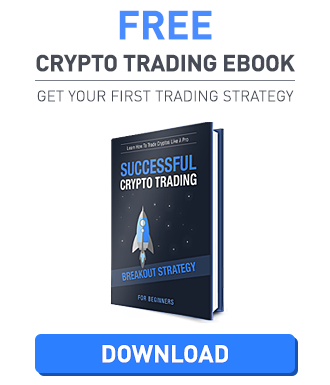 The website provides support for BTC and ETH and can help you with holding currencies during Bulls and be there when it goes down. The website does not say anything about their background or who is behind the project but they do have a Twitter account and support team which you can contact through support@turtlebc.com. To create an account with TurtleBC all you need to have is an active email address and you’re good to go! After providing the email address a confirmation email will be sent to the provided address along with your temporary password. The password can be changed once you have logged into the website. Please be advised that the trial period only lasts for 24 hours, so make sure that you have cleared up your calendar before exploring the website. 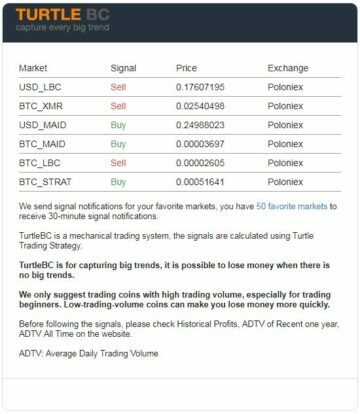 Signals – At Turtlebc you will be able to get real-time turtle strategy signals, MACD strategy, and updates in general from the website. This is probably the most basic feature that all of the websites that we will be talking about today will have. Altcoin Price – The website provides a complete list of Bulls and Bears to give traders reference on trends that have been reoccurring through the years. A good trader will find this feature very useful and may use it to their advantage to predict the next big trend. Referral – Most people go to websites that they will be able to invite their friends and family over because of the available referral bonuses they could get. Here at TurtleBC.com, you will get 20% of the referred individuals. Success Guides – There are a few tips and guides that you will be able to read about on the website. As mentioned earlier, you get to have one free trial day which you can only activate within 24 hours of creating an account with them. Subscribers will be able to pay using BTC or ETH with the option of getting one month or a year access to their services. Please be advised that all mentioned prices below are under USD. Crypto prices may also vary depending on the current exchange rate. The website also does not provide any refunds to purchases. Subscribers will be able to support websites such as Binance, Bittrex, and Poloniex with their BTC, ETH, BNB, USDT, and USD updates. Atomsignal.com is a signal service website that has been operating since 2017. They support a huge number of exchange websites which you will be able to enjoy and use your advantage at! The only setback with the website is that they do not offer any free trail accounts making it hard to get a grasp on what they have to offer as a whole without paying for at least a month of subscription. To create an account we first need to head on to their website and provide an active email address along with your username and password. Once these requirements have been submitted, you will be receiving a confirmation email at the provided address. Here at Atomsignal.com, you will be getting more than just the regular features that you get from other websites. Below are the features that subscribers will be able to enjoy with their membership. Daily Trends – You get a lot of trends sent to your email regarding three different signals namely Heikin Ashi with 65% win rate and 12% average profit, Turtle Mid with 50% win rate and 30% average profit, Turtle Long with 40% win rate and 55% average profit. Referrals – The website offers a lifetime commission of 20% on all subscriptions that you get under your name. The referral link is available once you create an account with them so once you get an account, it wouldn’t hurt to start inviting people to try the service out. Market Chart – Market chart can be used to get an idea of the market movement from the selection of available exchange websites along with the crypto listed. Easy Account Creation – Account creation is fast and easy and you do not need personal information to get it done. Atomsignal.com does not have free trial sessions wherein you will be able to go through their features without having to pay for anything. The website hides everything behind their subscription curtain and this is quite disappointing! Below are their rates starting with a monthly plan. Atomsignal.com supports a lot of exchanges! We’ve got 247exchange, 51szzc, Abucioins, Abwang, Acx, Aex, Aidosmarket, Allcoin, Bancornetwork, Bccexchange, Bcex, Beibt, Bibox, Biduobao, Bigone, Binance, Bisq, Biz-a, Bitbank, Bitbay, BitcoinIndonesia, Bitex, Bitfinex, Bitflip, Bitflyer, Bitgrail, Bitholic, Bitinka, Bitkonan, Bitlish, Bitmarket, Bitmex, Bitsane, Bitsblockchain, Bitsharesassetexchange, Bitso, Bitstamp, Cex, Coinfloor, Coinut, Gdax, Hitbtc, Kraken, and a whole lot more! Check out the complete list on their website by creating an account. Coindata.io is one of the websites that provide crypto signal services. Currently, the website is unavailable and we are unable to provide you with the updated subscription fees that they have. We, however, have information on their previous features being provided when they were still live. Huge Roster – The website provided a complete list of every coin available to be traded within Poloniex and Bittrex. This created a very good overview of what’s happening across the board between two large exchange websites. Pump Notification – This is one of the most important features that the website has offered to their users. The ability to warn you of a possible pump and dump situation before it happens can be used to a great advantage. Aside from the email notification, you will also have access to their Twitter account that will notify everyone that a possible pump is being done. Anonymous – All your trades are safe and IP Addresses are not stored. Affiliate – This is probably the most famous feature of other services today. With Coindata.io, they previously offered 50% for all your referred clients that purchase any type of subscription. Before the website went “dark” they supported Poloniex and Bittrex.